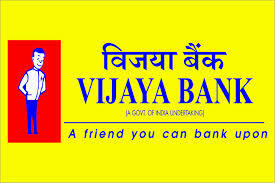 Vijaya Bank has published Advertisement for below mentioned Posts 2017. Other details like age limit, educational qualification, selection process, application fee and how to apply are given below. Educational Qualification: (1) Graduation / Degree in any discipline from a recognized university. Professional qualification in Treasury will be an added advantage and will be preferred. (2) The Executive should be of the level of Dy. General Manager/ equivalent and above in Public Sector/Private Banks / Financial Institutions, Investment firms, etc. Application Fee: ₹ 600/- for application fee including intimation charges of ₹ 100/- for OBC Category and General Candidates; ₹ 100/- Intimation charges only for SC / ST / PWD Category Candidates. The Payment to be made in online mode only. Contract Period: The period of engagement shall be initially for a period of 03 years. Depending upon the Bank's requirement, the period of engagement may be extended for an additional term of two years at the sole discretion of the Bank. The maximum period of engagement will not be more than 05 years. Compensation: ₹ 75,000/- paid in the lump sum every month on the consolidated basis. How to Apply: Eligible candidates can apply only online from 22-11-2017 to 09-12-2017 (both days inclusive). After applying Online, candidate should obtain a Print-Out of Computer Generated Online Application, which should be annexed with all necessary documents substantiating the candidature and should be sent through ordinary post only, in a closed envelope super-scribed "APPLICATION FOR ADVISOR-TREASURY ON CONTRACT BASIS-2017-2018 in Vijaya Bank", to "The Deputy General Manager-HRD Vijaya Bank, Head Office 41/2, Trinity Circle, M.G. Road Bengaluru-560001".